Frank Lloyd Wright houses are esteemed pieces of architecture, designed by one the most iconic architects and visionaries in US history. Almost 60 years on from his death, many of his 532 completed structures now require specialised and specific restorative work. 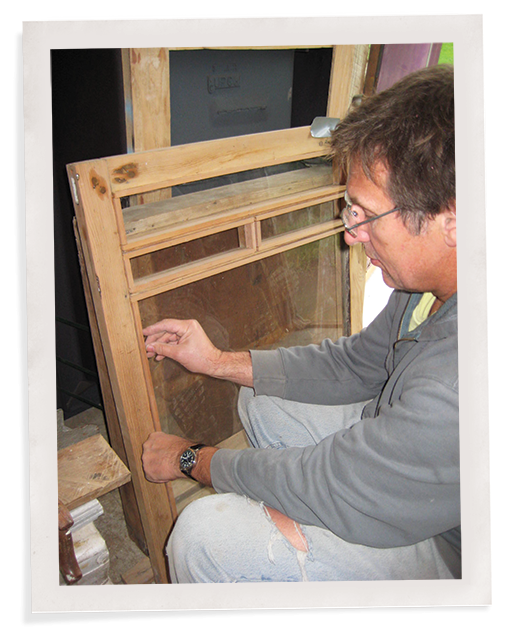 Old window repair is a challenging, daunting task at the best of times, even more so in Frank Lloyd Wright houses. Wright cared about windows, and designed his structures around natural light and views. To undertake this kind of specialized work requires skill, research and experience. In this video, John runs through the process of restoring historic Frank Lloyd Wright windows, and tell us why these original windows are so valuable. Having trouble with the video? Read the full transcript here. It’s pretty easy to identify the iconic houses of Frank Lloyd Wright. Especially if you live in Chicago. Who would ever allow such a beautiful work to fall into such disrepair? Unfortunately, many of these homes did. But key preservationists such as John Eifler have been taking the lead in breathing new life into these structures. Eifler is Chicago based architect with a professional portfolio of restoring many of Wright’s buildings. In 2008, he undertook the restoration of a Wright house as his private residence. At the time of purchase, it was sold as a tear-down and was completely uninhabitable. It had a leaky roof, plumbing and electrical issues, and purple painted trim on the exterior. The renovation Eifler undertook, took the home back to the original design and dramatically improved the energy efficiency of the space. In a recent article in Arts & Crafts Homes, Eifler had this piece of advice for approaching any home restoration: “Restoring a house with cultural or architectural significance can be overwhelming. You’re responsible for determining how history will be represented on the finished project. There’s no formula, as each house is important for different reasons. One theme is consistent though, the research must be done before the work. Do not jump in to a project without knowing when the house was built, who designed it, and for whom it was built. Know exactly what is original and what revisions and additions were made over time. Only with this knowledge can you make informed decisions about restoration and improvement.” Eifler’s tour through his home will review the history of this home, the process he went through to bring some of the original intentions back to life, and the updates he implemented for modern living. Hi, my name is John Eifler, and this is the Rock House. My partner Bonnie and I have been restoring it for seven years and the biggest problem with historic homes are the windows. And that’s what we’ll be talking about. But, before I do, I wanted to give you a little context. This house was designed in 1916. It’s one of five houses that exist in the Ravine Bluffs subdivision. If bonnie could pan to the right, you’ll see that there’s a Frank Lloyd Wright house on the south side as well as the north side. And it was designed for Wright’s attorney Sherman Booth, these are all speculative homes. Our house is based on the house for $5,000 that Wright designed. They’re all stucco, they’re all trimmed in cypress, the windows were all single glazed originally. And the difference that you can see in our house is that the windows have been converted to the way that they existed on the drawings that is there is a wooden stop to keep the glass in place. The other homes were done by the original contractor with a putty glaze stop and when you go to putty, that means you have to paint the wood because you need to cover the putty. But that’s not consistent with how Wright used to his homes. It was always a cap of stain of some kind which allowed the grain of the wood to come through. So, we went back to the original scheme with the wooden stuff and restored the windows over about a six or seven month process. Okay, so this is a great example. This is actually my basement window, which goes in there. There’s a screen on the outside. These flip up and hinge at the top and go upwards, they’re called awning windows. But this is a great little example of what we went through with the entire house for the most part. Now all these windows are put together the old-fashioned way. There’s tongs that come through and tied together. And we found that after a hundred years, this joint had come loose, so once we stripped everything, we had to reconnect everything back together again. And rather than making sure that everything was attached in the same way, we augmented the support system. You can see here there’s little holes and what we did is we took three-inch stainless steel screws, we counter something about an inch and sunk them deep into the rails of the window. So everything is much more firm, tied together and should work for another, ya know, hundred years without any problem. The other issue that occured on these windows is that, in their original drawings, it showed a three-inch wide wooden stop that was to keep the glass in place. Now, in all of the houses here in Ravine Bluff, that detail was eliminated. Instead, they used glazing putty, which would have been applied to a surface much like this and at 45 degrees, or 60 degrees roughly, the glazing putty kept the glass intact. Now, what that means is once you go to glazing putty, you have to use paint, or solid body stain, rather than the, you know, cabin stain that Wright originally intended. So we decided to go back to the original detail, as Wright originally drew, and use a ⅜ inch stop, which makes a big difference in the appearance of the window. Now that has been made even more complex by the way in which we’ve chosen to retrofit the older sash to accept insulating glass. That greatly increases the R-Value and insulation capability of these windows. So you start with the old, wooden frames. You buy a router and you basically rout out an extra eighth inch all the way around to accept half inch insulating glass low-E, R-Value of around 4, I believe, as compared to .9 of single pane glass. So we’ve definitely increased the insulation value of these old windows. Now the tricky part came with this ⅜ inch stop that Wright specified for these windows. What we ended up doing was having special stops made and milled that started at the ⅜ inch thickness of the outer face and then beveled to half inch at the actual glass face. This is needed in order to cover the silver be candid separating strip between the two layers of glass and yet retains the original thinness of the detail that Wright specified. So, other than that, you can see we bought new sprung bronze weather stripping and attached it to the bottom. These windows have all been coated with three layers of Sikkens, some of the other things that you end up doing is using a lot of putty to fill holes that have been made over the years. The owner in the past years, sealed Ls to keep things together, which we removed. Some of these will be reused again, this is just the little stops to keep the window in place. But, for the most part, we have hundred year old sash that will perform like new. This doesn’t have to do with old windows, it has to do with new windows and making them suit the needs of your house. This was originally an open porch. It had been enclosed and so we wanted to maintain the enclosure to keep an extra room for the house. But we wanted them to also make it appear as it once did. So, I designed these windows that are all hinged with piano hinges so that the entire space could become open. So, the way this works is, you just undo the clips, open one up, undo these clips, and this side opens up and through a series of bi-folds, the entire porch can be open once again. Our plans are to have screens made so this can be one continuous screen, but the amount of light and air it lets in there once they’re open is just incredible. Something to think about. So, the front windows are the solution that I’ve used most often for other Wright homes: Willit’s House, the Mary Adams house. They all have art glass in the front window panes. In our case, we salvaged all the old, original wavy glass on the outside and it’s kind of a nice effect and we wanted to preserve that as well. So what we elected to do is to have interior storms made that would fit in the old screen window pockets. And in this case, the glass that we used is in a low-E glass and it’s double pane insulating glass and with this you essentially get three layers of glass between you and the outside so the R-Value is actually much greater than get with new, contemporary windows. Now, in this case what we elected to do, because Wright designed a planter box right in front of the windows, which essentially makes the exterior windows unusable, these windows will remain fixed. So, in our other projects what I did was I had interior storms made that had matching screens so that one could take the storms out during the summer, put the screens in with one pin lift off hinges. But in this case, these storms will be permanent, because we can’t open the outside windows to begin with so we’re going to set these in place they haven’t been stained in the seal, but though there’ll be one catch at the top, which you can use to pull out the windows and clean both sides, outside and inside, then put them back up again. So this is the first solution to the window issue that we’ve been talking about. See Wright designed these very clever, not too intricate, but they’re very simple mullion patterns, into the window design. Now in doing so, it’s virtually impossible to replicate this with any kind of insulating window, or insulating glass. So what we elected to do up here was to use Indows, which fit snugly into the old screen pocket. And their cost is such that it was about one third of that of fabricating a more traditional interior storm, interior wooden storm. And it also works out for us pretty well because when, in the summer, we can take the Indows out and open the windows, like this, and we then use roll screens to operate them for fresh air. So every room has two windows that incorporate roll screens for the summer and the Indows stay fixed. Now in the rare event that we use air conditioning, the Indows come in handy because they actually increase the insulation values for air conditioning as well. But it’s a very simple system and I think it’s much easier to operate than pretty much any new window system out there. And the nice thing about the windows are, and I think this is a good point to be made, is that this is all old-growth lumber, this is very tight grain. This is a douglas fir that was cut from trees that were hundreds of years old at the time and they’ll last forever. All of the bidding is proper maintenance we’ve sealed everything Sikkens. You know, there are other products on the market that uv protective of the wood and in doing so, we feel that these windows will probably outlast any kind of new windows that come in on the market these days. Now the other important thing to keep in mind is that when you’re dealing with old windows, there is this thing called a sprung bronze weather stripping. You can see it here. We reuse much of it when you’re redoing the windows. But they’re these tiny, little nails that all hold it in place. It’s a sponge bronze, so it never really loses the shape over time. And this, itt presses against the sash performing a nice weather seal. Many new windows use a kind of expanded plastic bulbs and they’re great, initially, but over time they tend to break down, get dry and crack, whereas a sprung bronze is kind of an eternal solution. Now, the Indows also helped in the sense that the sprung bronze isn’t as tight as many new windows, there is a little bit more air infiltration with it. But the Indows really seal up tight next to the wood jamb and so infiltration is pretty much eliminated by using the Indows as the inner storm, which is a big source of inefficiencies with all of those. Okay, so the third solution that up with is for the exterior door on the porth on the second floor. This is the solution that we used at the Tomac House on Riverside, wherein there’s a permanent casement, casement door in this case, fixed to it and then there’s an inner panel which can be removed by means of these toggle switches. And in this case, when winter comes, we just flip all these up and the suite comes out and then could be replaced with a single pane of glass for an extra R-Value during the winter. This solution is not as energy efficient as interior storm windows because we only get one additional pane of glass here, not the low-E insulated glass I put in on the first floor. But regardless, it’s a good solution because it allows for both screens in the summer and storms in the winter. Eifler found a way to ensure comfort in his home without sacrificing the history and aesthetics. Make sure to read the full article in Arts and Crafts Homes for more details on this renovation and Eifler’s tips for approaching your preservation project. John Eifler spent decades restoring Frank Lloyd Wright homes before buying one himself in Glencoe, Illinois. An iconic American architect, Wright cared about windows and designed his homes around natural light and views. Eifler wasn’t about to replace any of the original windows even though they needed a lot of work including removing layers of lilac paint.